HomeBlogCommunity newsBuild a weather station with Flip&Click and Weather click at the Technical Museum of Vienna this April! 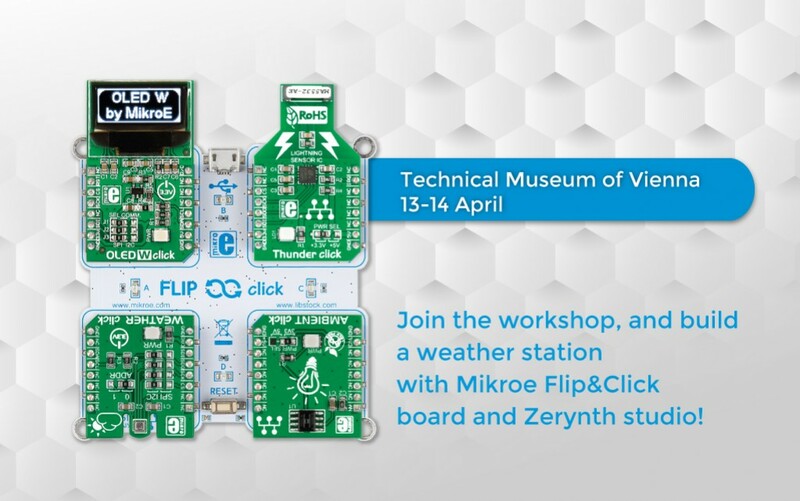 Build a weather station with Flip&Click and Weather click at the Technical Museum of Vienna this April! If you are in Vienna on April 13 and 14, come to the Technical Museum Vienna and join one of the workshops on Python programming. The workshop is about building a DIY weather station using the Mikroe Flip&Click development board, the Weather click, and Zerynth for programming. It can be made with just a few lines of code! The man-machine subject will be at the center of the Technical Museum for a whole weekend, inviting visitors to try out new technologies themselves and playfully engage with them. Find out more on how to use Mikroe Click boards™ with Zerynth on the Zerynth blog post. Visit the Technical Museum of Vienna on April 13 and 14, and join the family workshop. The workshop is designed for 14+ years old. Participation is free, excluding the museum entry.